The Nartker Family: Guesses anyone? I love this picture. 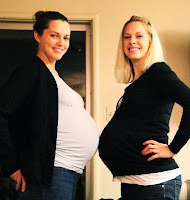 You two are some of the cutest pregnancy ladies ever! We can't wait to meet your little one -- hopefully soon! I'm guessing, January 18 and he'll be 8lbs 1oz. I guess January 12th (you are normally two weeks early, right?) good luck!! cant wait to see picture. I say Jan 16th and he will be about 7lbs. Hope I get the treat!